Illustration o an electrolysis apparatus uised in a schuil laboratory. 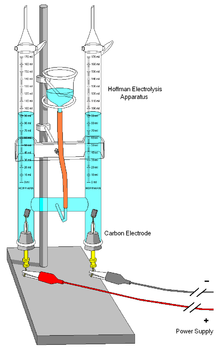 In chemistry an manufacturin, electrolysis is a technique that uises a direct electric current (DC) tae drive an ithergates non-spontaneous chemical reaction. Electrolysis is commercially important as a stage in the separation o elements frae naiturally occurrin soorces such as ores uisin an electrolytic cell. The voltage that is needit for electrolysis tae occur is cried the decomposeetion potential. This page wis last eeditit on 3 Mey 2017, at 00:10.